The purpose of Thersites is to give insight in the phenomenon of the tar dew point and to allow calculation of tar dew points of your product gases. 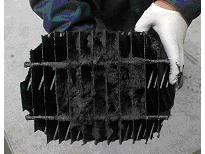 Tar condensation initiate fouling in a biomass gasification process that ultimately can result in the malfunctioning or plugging of equipment. The high maintenance costs and reduction in the yearly operating time due to stand stills leads to an increase in the operating costs. 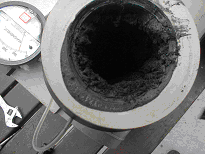 Knowledge about the condensation of tar is indispensable for the reliable operation of a biomass gasification process. The tar dew point is an important thermodynamic property for condensation. The tar dew point model of ECN can be a useful tool for trouble shooting, process optimisation and process control. The complete model includes the relevant characteristics of 34 individual tar components. You can use a simplified model by clicking on simple model. This model only contains 6 important tar components. Thersites was a member of the Greek army in the Trojan War. He was said to be the most ugly and malicious soldier. He was famous for his unpleasant temper and his love of argument. Generally hated by the Heroes; Odysseus gave him a serious beating and when he mocked Achilles for mourning the dead queen Penthesilea, Achilles killed him. In modern times it seems that Thersites has been reborn in the appearance of “tar”.